Tested and approved!!! So do not rely on the brand ... 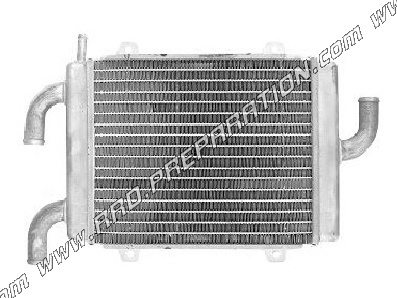 This heater is manufactured by a good radiator manufacturer, marketed by TNT. it is normally intended for scooter PEUGEOT SPEEDFIGHT. This model aluminum will be ideal for a proto adaptation because it extracts heat very well, has a light weight and is very compact. Delivered naked, it's pretty late. It can be installed on various mob and prototype. Its price is very correct and is placed under the great brand. It has 2 inputs / coolant outputs (X3 Ø18mm / X1 Ø8mm). Fasteners: 2 on each side, not threaded in with Ø6mm distance between centers of 130mm on each side). Input and output: 3 Ø18mm for internal hose Ø 18 a 19mm & 1 Ø8mm hose for 8 to 9mm.